Plextor, a leading developer of digital storage technology, makes great preparations in compatibility and optimization with regards to Windows 10 and Skylake, the two launches respectively by two of the computer industry's largest software and hardware companies, Intel and Microsoft. Advanced gamers can choose M6e Black Edition or M6e M.2 SSD using PCIe interface. Mainstream users can choose the M6S SATA 2.5 SSD, which received great reviews in Japan. Entry-level gamers must not miss the most affordable yet highly efficient M6V-series SSD. Targeting the consumer market, Intel has launched a sixth generation Core processor platform called Skylake, including CPUs of model numbers beginning with a "6," as well as 100-series chipsets. The most obvious change of the new CPU and chipsets is that the newest DDR4 memory is used. Compared to DDR3, DDR4 is more efficient and requires less energy. However, the price is slightly higher than that of the currently mainstream DDR3 memory. Whenever a next-generation processor hits the market, without a doubt it provides a better and more energy-saving efficiency. Simply put, compared with processors of the prior generation, the computing power is increased by over 20% in financial analysis and professional computing. Before Skylake, Intel’s internal graphics cards were merely passable but the video performance enhancements as a result of Skylake were obvious. For example, under the mainstream resolution of 1080P and with special effects configured to around medium, MOBA games such as DOTA 2 or LOL and adventure games such as Biohazard or Resident Evil are easily supported with these graphic cards. 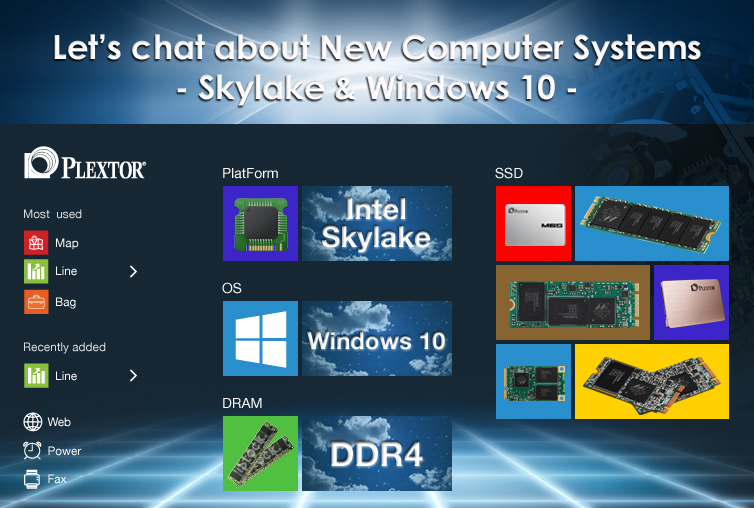 It can be seen that the improved capabilities of Intel’s Skylake platform is not to be underestimated. Additionally, a particular concern to gamers this time is that Intel temporarily removed the original FIVR power design with the release of the Skylake platform. DIY gamers accustomed to overclocking may once again have the opportunity to overclock their CPUs. Finally, what is worth noting is that the new CPUs are incompatible with old 90/80-series chipsets. Everyone should take care to not enthusiastically buy the new CPU only to discover that it cannot be used on computers with incompatible chipsets. Microsoft has released the newest operating system Window 10 at the end of July, which is the subject of attention of even more computer users around the world. With the rise of tablets, Microsoft had hoped to redefine operating methods for computers through Windows 8. However, since the release of Windows 8, the revamped operating interface received mixed reviews. In the newest operating system Windows 10, Microsoft brought back the Start Menu at the bottom left corner of the screen, which the users have been accustomed to since Windows 95. Through free upgrades, consumers using older Windows 7/8.1 can freely use the newest operating system. Consequently, Windows 10 has become the fastest growing operating system since its release. Windows 10 is also the operating system that is most able to realize the hardware capabilities. Past Windows operating systems do not completely support multi-core CPUs. So even if an expensive 8-core processor is installed, its capability cannot be fully realized. Now, Windows 10 can start multiple desktops after starting Task Mode. Each of the desktops can present the program currently being used. Advanced gamers can even assign processor core and the program thread to be executed, showing great professionalism and strength. For gamers who love games, Windows 10 provides DirectX 12 game engine, which can greatly increase gaming performance. Gamers can enjoy the smoothest graphics and the best gaming experience when games supporting DirectX 12 hit the market. So you decide if Windows 10 is important or not.